← Not enough patience, Uncle Bob! My obstinate anti-LinkedList blog entry which turned into a CodeProject article recently took some heat from a former college, David. I think his objections were smart, to the point and important. Many of his objections came up earlier at CodeProject but instead of expecting the reader to read through all the comments there and here I decided to take a different approach. Instead of doing an easy-to-miss reply in the comments I decided to do a blog sort-of reply here. I am sure many has the same objections and questions as the ones earlier asked, and it is good to bring them into the light (questions + people ;). This blog post will highlight some issues that were not clearly explained or could be misinterpreted. Well put. I could not agree more. Some of the irate comments I have received I can sympathize with. My anti-LinkedList entry can be argued used somewhat contrived examples, even if I actually used real-life examples that I have encountered. David was so kind as to suggest a few examples when LinkedList should shine. Let us look at them and compare. Let us also quickly do a recap of what the article showed. On algorithms: Doing performance testing on data structures is tricky. If your algorithm is faulty, working against the nature of the structure or has logical errors you can get bad performance even if the produced result is correct. Looping through a LinkedList using index, or through an ArrayList using iterator are both examples of working against the nature of the structure. Both will also have a sad impact on performance. In the testing below such against-the-nature approaches are called “naive“. Such a naive approach is probably taken by mistake, by laziness or by lack of knowledge : it might just be that it is pseudo intuitive for coders who have not bothered to understand nor read up on how the structure works. A more sad reason for choosing a naive approach is when the coder follows the rule of premature pessimization. This is a Java optimization artifact and whether justified or not I decided to run the tests cold. Thanks to David’s and @rc’s comments I can soon update the Java section on the article. At the time of writing the Java section is just simply wrong. They [David and “rc”] (aware or not) kindly helped me to understand how to squeeze out the cache boosted performance out of Java’s ArrayList and how a wrong use of it and LinkedList will just give horrible performance for both. Huge blunder by me. Of course a LinkedList should use iterators instead of calculating the indexes. That approach was born out of a desire to be generic. It very much fits my own description of naive and I was happy to correct it. Thank you for pointing it out. When treating both structures right, and comparing them in the original scope the ArrayList still shines over LinkedList. Correcting the code according to David’s example fixed the code and for a while LinkedList rocked in comparison to ArrayList. This just did not make sense to me and I decided to skip being naive and read up on ArrayList. This resulted in simple changes that lead to a huge performance boost for ArrayList. For performance reasons traversing the ArrayList should use the random access lookup and being treated in function calls as an ArrayList and not as a List (my bad). It will remove some from being generic and it will hurt the object oriented fanatics but it will squeeze out that cache-friendly nature of it that we want. The only difference between the snippets above is that the ArrayList is at top iterated through the List interface and in the second it is iterated through the ArrayList interface. The difference in performance is huge. So almost identical code, for the same structure is behaving radically different. If you would use iterator instead of random access lookup then the ArrayList would perform even worse. Please see this reference at Oracle for more information. 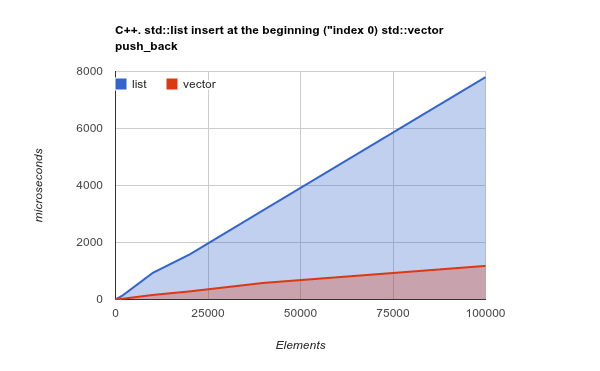 In Java the C++ std::list equivalent is called LinkedList. The C++ dynamic array std::vector is in Java called ArrayList. There is one big difference between these libraries, both the Java LinkedList and ArrayList can only contain objects. This means that the boost of adjacent memory will be somewhat less for an ArrayList containing Integer objects. To access and compare values for the search there is one extra indirection, from reference to value. 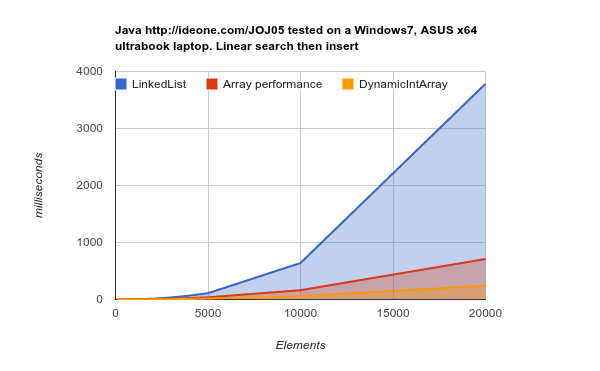 With the corrections in place the LinkedList showed immediately that it was performing worse than the ArrayList. For the test on ideone.com (http://ideone.com/JOJ05) the LinkedList was performing from a factor of 1.5 to a factor of 3 slower then the best array container. What this scenario really shows is that the overhead of array shuffling, creating larger arrays when needed and copying content to the larger array is not that expensive performance wise. At least in comparison with traversing a disjoint memory structure with lots of cache misses, lots of cache loading and slow RAM access to get what to load. I.e. there are lots and lots of cache misses when traversing a LinkedList. This means idle CPU cycles. Which is expensive. Which means that that even though more data has to be shuffled the adjacent memory structures ArrayList and DynamicIntArray win in this silly scenario. I.e. search time + O(1) is slower than search time + O(n). What does this mean? Yes. Exactly. Or. Kind of. Cache is much faster then disjoint memory traversal (lots of RAM fetching). However doing the big O comparison is just pointless. Let me be repeat this: It is pointless to compare algorithms that way. Please, everyone who reads this. Be extremely careful when juggling Big O – you are on a slippery slope if you use it for drawing conclusions of which container or algorithm to choose. If comparing algorithms and containers beware for drawing conclusions like X with O(n) is slower then Y which has O(1). Or statements such as Y with O(n log n) beats Z which runs in O(n2). Big-O notations tells nothing about how one algorithm fare against another algorithm. Big-O will only tell you how performance will degrade as n increases. This might be clumsily written out of frustration. The mathematical models are accurate but are so severely abused in the computer science area that I consider them [for coders use] to be flawed and dangerous. Remember this from the linear search, then insert example? LinkedList insertion is: search time + O(1). ArrayList insertion is search time + O(n). 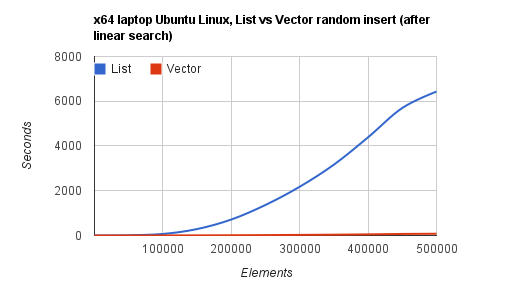 In the silly example “search then insert” the search complexity for both was O(n). 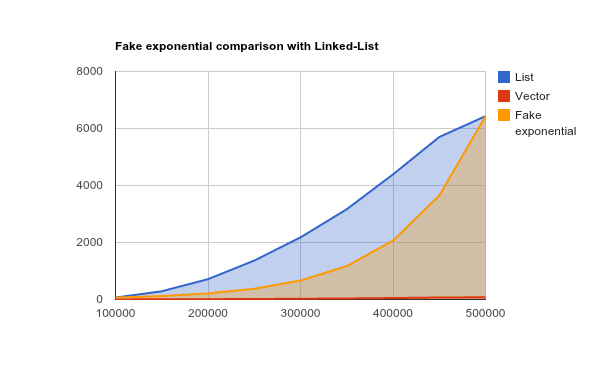 But the search time for LinkedList grows rapidly, at first seemingly near exponential up to a certain level. 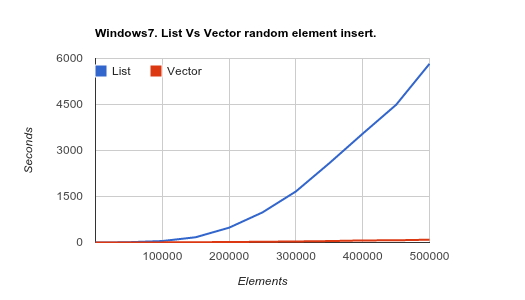 C++ std::vector vs std::list for linear search then insert of random values. Here on Ubuntu it is very clear how the curve levels off. Fake exponential function for comparison. If monitoring the numbers closely you would see that the exponential growth formula does not work. The growth factor decreases and eventually it clearly levels off. At these levels the time usage for linked-list is absurd but I thought the fake exponential display would be good for clarity. The linked-list search time does not grow exponentially, it is just excruciatingly slow from the get-go. A code and performance comparison between these three insertions can be seen at http://ideone.com/DDEJF. It compares between the common linked-list operation : insert at “index 0” vs std::vector push_back vs a naive std::vector “push_front". [..] to filter an array of elements, removing the values that are above or below a threshold, perfect for an linked list (http://ideone.com/KM5Ev)! And wouldn’t those examples be “Number crunching problems”? Yes. Definitely in the number crunching area. Let us take a look at that then. Remember that we are trying to be realistic here. The naive approach might be interesting but will not prove anything. Let us look at how we can apply both structures at their best to solve the filtering problem. For small range of values, 10 – 1000, even the completely naive array-based solution is just as fast or faster then the Linkedlist. This means that for smaller ranges the cache friendly array structure is much more forgiving. It is not too bad to use a completely naive solution and still beat or come in split position with LinkedList. After 1.000 elements the naive array-based solutions pay the price. For the more sensible array-based solutions the relative order of effectiveness seems to be pretty much the same from 1.000 elements up to 100.000. I.e. the array-based solutions beat the LinkedList solutions with factor ranging from 1.5 up to 4. Maybe not that much difference but still, remember it is the battlefield chosen to favor the LinkedList. The initial “linear search, then insert” should of course never be thought of as a optimal way of sorting a data structure. It is in fact an extremely slow way of sorting. Not in my wildest dreams have I even considered the possibility that anyone would consider my example as a suggestion for sorting. Please do not do that. It is there to prove a point. Nothing else, nothing more. For both linked-list and the dynamic array the initial “sort” example is very ineffective, but the point was made! Sorting is interesting. 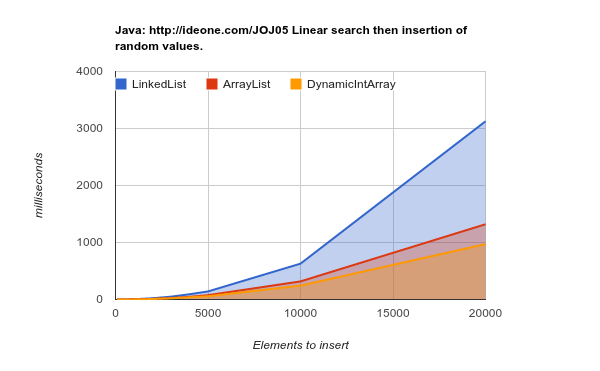 How will the LinkedList fare against array-based structures when it comes to sorting? By now the answer should be clear, but let us verify it first, shall we? But the algorithm for sorting one data structure will not be effective on another. Here we initially trust the Java (and C++) libraries to be as effective as they can for each data structure. Sorting the data structures using the Java Collections.sort(…) for ArrayList and LinkedList and Arrays.sort(…) for the raw array gave the following. For me, this is uncharted territory. I read somewhere that Collections.sort would dump the list into an array and then sort it. I read somewhere else that Arrays.sort(raw_array) would use QuickSort but that Collections.sort(LinkedList) or Collections.sort(ArrayList) would use MergeSort. 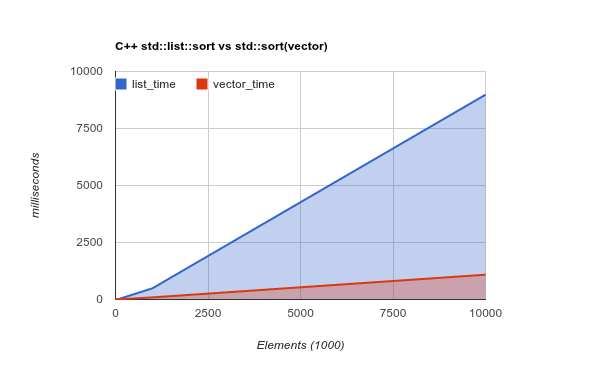 Whatever the case was I could compare their performance related to each other, and expected to see similar figures as when I compared C++ std::list::sort and std::sort(vector) (http://ideone.com/3eouT). As n grows the C++ sorting of the array became more effective compared to the std::list, not less as shown in the Java sort example above. Why did the Java sorting relative performance not follow the C++ example as the numbers went up? It is still somewhat of a mystery but I got closer to the answer when I just had to take care of a must-try “itch” that I scratched by trying out Quicksort on the DynamicIntArray. C:\temp>java -Xmx756m Main   . Times in microseconds. Collections.sort on Linked-List and ArrayList. Putting this into a chart instead put mayhap things into perspective. This relationship between DynamicIntArray/QuickSort and the rest looks almost identical to the C++ std::list vs std::vector sorting. The Arrays.sort and Collections.sort(ArrayList) follow, surprisingly, very closely the Collections.sort(LinkedList). I seriously doubt that my QuickSort is that effective, the explanation lies elsewhere. I.e. 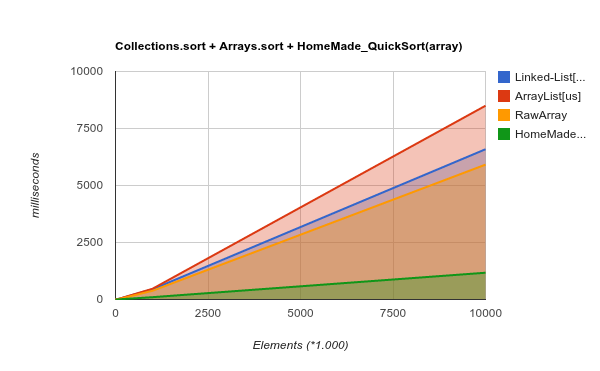 to me it seems like the positive cache effects seems to be missing from Arrays.sort and Collections.sort(ArrayList) while the cache friendliness of the array is showing for the DynamicIntArray/QuickSort. But hey, I am Java naive so maybe it has a natural, very obvious explanation that is escaping me. Maybe delving into this mystery will be the subject for a future blog entry? Any new conclusions to draw from all this testing? Well, choosing the right algorithm for the task is of course of paramount importance. And choosing the right data structure goes hand in hand with that. The CPU-cache architecture plays a huge importance of course. On ideone.com the cache performance boost is not that significant. On a modern x64 ultrabook laptop the boost is so much more. If anything the use of ideone.com in this blog entry downplays the relative performance boost of cache friendly structures vs cache hostile structures (linked-list). Please try out the ideone.com examples yourself, at ideone.com and on your computer. Notice that your computer will (likely) show much larger difference – favoring the ArrayList and DynamicIntArray. In the area of number crunching you will be hard pressed to come up with realistic scenarios where LinkedList with its disjoint memory beats array-based contiguous memory structures. Even for the LinkedList favored scenarios it was dead simple to beat it performance wise. LinkedList has its uses. It is not horrible to use LinkedList,. but make no mistake about it. In the area of number crunching there is one who almost always rule. The Array is King. This entry was posted in C++, Java. Bookmark the permalink. I.e. example of when ArrayList is unnecessarily slowed down because it is iterating as a List and not an ArrayList. The ArrayList loop will be roughly twice as fast as the List loop. It calls exactly the same methods of ArrayList, whatever the apparent type of the variable is. [ Silly “insert sorted” to prove a point ]. I think you should find it clearer now.